In June 2009, my Aunt Nana and I went on a cross-country road-trip from Virginia to Colorado and then back to Virginia. Whenever I remember this trip, it makes me think of Lily because that is the month her life began within me. We drove through many states and had such a special time together, stopping along the way and doing memorable things such as going up in the St Louis Arch. 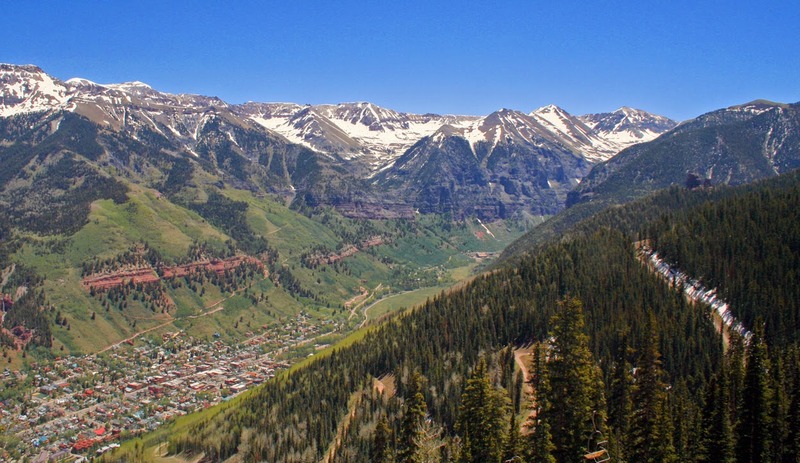 The main purpose of our trip was to attend the Telluride Jazz Festival in Telluride, Colorado. Oh my, is Telluride gorgeous!! Colorado is one of the most beautiful states in the country, in my opinion. I'm not sure where any photos from our trip are, but hope to find them at some point. I have souvenirs from the trip, including a mug that I regularly use, and a scarf, and magnets. And in some of the only photos I'll ever have of Lily, her father is wearing a shirt that says "Telluride, Colorado" on it. This road-trip was such a fun adventure! I can hardly believe it was six years ago now. I was 19. I remember so much from this trip and now associate Telluride with first discovering I was pregnant. My aunt really liked a singer named Lizz Wright and she was at the jazz festival. Hearing her music takes me right back to that time. It is so bittersweet. This is random, but it's just another thing that reminds me of Lily that I want to share on my blog.